Leather is a very versatile and durable material. This is the very reason why people love to buy a pair of leather slippers. The style and comfort which the leather slippers offer make people fall for it. The best quality about leather is it softens as it ages and the fitting gets better and better. The leather slippers are quite versatile. You could wear them with jeans, pants, jackets anything and they would match them all. Many of you might not know that leather has a propensity to absorb oils. So buy yourself a leather slipper which is light in color. Wear them sometime and when you get bored just apply 1-2 coats of oil and you get a darker shade. So you get two slippers at the price of one. And moreover as they age they mould to your foot contour and shape and so the fitting gets better with time. Another quality which is much appreciated is that you could tan and dye your leather slippers. 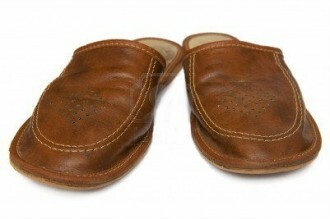 The leather slippers are available in much variety like leather slippers with thin sole or with thicker ones. So if you are planning to trek wearing the slipper pick one which comes with a thick sole. You could also choose either the stitched ones or the glued ones. But I prefer the stitched ones not because of durability but because the stitched pattern looks so good and adds to the beauty and style of the slipper. Though people prefer to buy leather slippers in winters as they keep the feet warmer but still many wear them all the year around and make a chic fashion statement. Even people who suffer from postural problems and feel pain while walking could wear them. Why, because a cushioning effect is provided at the toe which is so soft to feel and one doesn’t feel any pressure. So no back pain or discomfort while walking. If you are looking for some extra softness and warmth you could even buy yourself a pair of wool line slippers. You could even choose from a wide variety ranging from rough, suede to polished leather. The most popular of all the leather slippers are the moccasin slippers which are made from both rough and suede leather. But there are certain other high end leather slippers which are manufactured from polished leather. Leather slippers manufactured from polished leather would be a bit costlier than the rough or suede leather because of the craftsmanship and a lot of detailing involved. But cost should never be a factor when you are buying a leather slipper. This is because of the plethora of the features it possesses. The durability, the versatility, the style, the comfort all these make leather slippers a must buy.